We construct advanced models of the atmosphere and ocean, which we deploy at high resolution, seeking to resolve the phenomena that underpin our understanding of weather and climate variability and change. As well as studying these systems in high detail, using process-based diagnostics and metrics, we also use advanced visualisation to gain an overall picture of system interactions. The first animation shows a number of atmospheric and land surface features: from clouds (white to grey scale) to precipitation (colour scale, mimicking a meteorological radar image) to snow and ice at the surface. 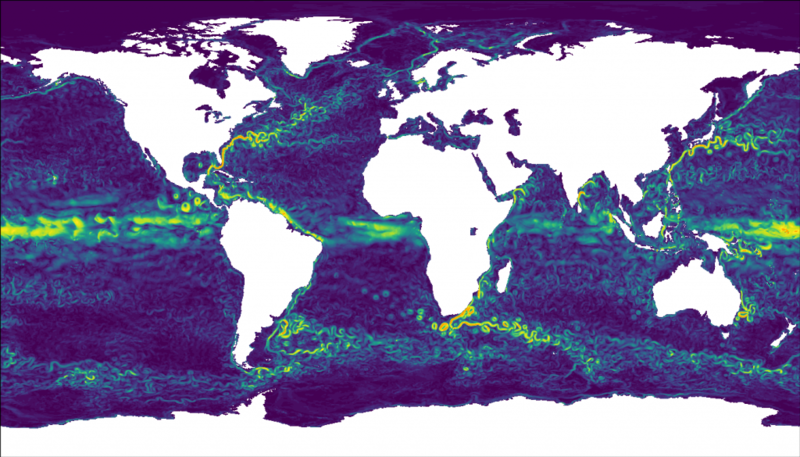 The colours in the ocean are Sea Surface Temperatures, which in this case are imposed from OSTIA-SST, as we used the AGCM version of our model. Animation of atmospheric, land surface and cryosphere features in HadGE3 GA3 (UPSCALE). 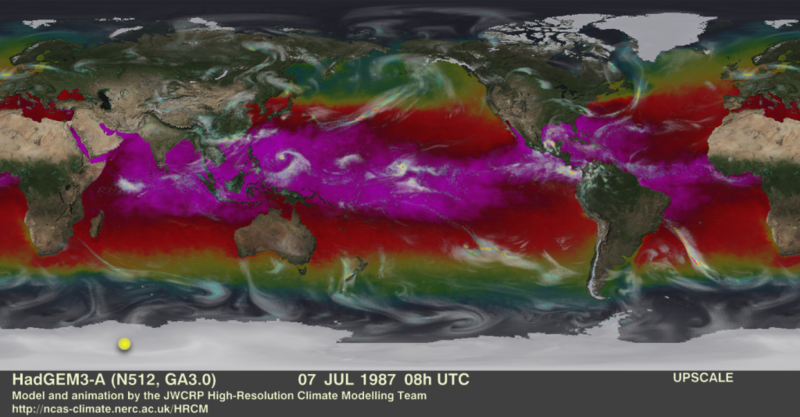 The OSTIA SST (colour scale in the ocean) were used to force the atmospheric model. Clouds (greyscale), rain (colour scale within clouds) and snow+ice (white colour on land, pale grey over the ocean) are dynamically produced by the model. Credit: P.L. Vidale, R. Schiemann and the UPSCALE team. 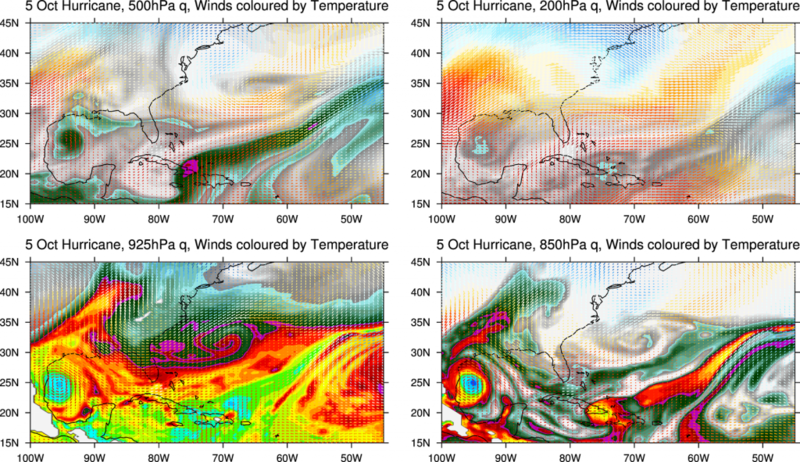 The second animation shows a number of oceanic features, mostly eddies and Tropical Instability Waves. This simulation was produced with HadGEM GC3.1, with NEMO as the ocean model (1/12 degree resolution) and HadGEM3 GA7.1 as the atmospheric model (25km resolution). Surface ocean current speed as simulated by the NEMO ocean model at 1/12 degree resolution. NEMO is coupled to HadGEM3 GA7.1 at N512 resolution. Credit: M. Roberts, Met Office Hadley Centre. The third animation shows the evolution of two tropical disturbances in the Atlantic ocean, one of which evolves into a full Tropical Cyclone, while the other moves North and undergoes extra-tropical transition. The model used was HadGEM3 GA3 as (25km resolution).